An 18-year-old woman accused of stabbing a man to death was given the knife by a friend who later told her to "get rid of it", a court was told. Martyna Ogonowska said she did not realise she had stabbed Filip Jaskiewicz as she fought off his advances in a Peterborough car park. Cambridge Crown Court heard Mr Jaskiewicz, 23, died of a single stab wound to the heart last October. 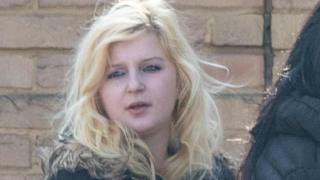 Ms Ogonowska, of Peterborough, denies murder and possessing a bladed item. Speaking through a Polish interpreter, Ms Ogonowska said on the night of the killing she had left the city's Solstice nightclub with two friends - Zofie Fedakova and Peter Csisco - and all three had agreed on a lift home with Mr Jaskiewicz. She said she felt scared as Mr Jaskiewicz "didn't pay attention to other cars" and was "driving too fast". The four arrived at Oakdale Avenue just after 04:00 BST. Ms Ogonowska told the court she "got nervous, left the car and slammed the door" but that Mr Jaskiewicz followed her and grabbed her neck, forcing her to her knees. He later apologised after her friends intervened and returned to the car, where he "started to be aggressive towards me again", she said. "He grabbed my breasts and said they were his. I didn't know what he was capable of", she told the court. The jury heard that the two women then spoke outside the car. "Zofie showed me the knife", Ms Ogonowska said. "She said probably I will need it. She put the knife in my hand and I put it into my left sleeve." The jury was told that Mr Jaskiewicz became "aggressive again" and that the pair had struggled in the front seats of the car. "I didn't know where the knife ended up", she said, "I thought it had fallen on the seat but then I saw the blood". She said after the incident she left the car with her friends and that Ms Fedakova told her to "get rid of the knife".